Many areas are difficult to reach or access, especially when you experience limited mobility and balance as you age. Seniors have to be much more cognizant about how they get in and out of bed, the bathtub, the car, and the list goes on. For seniors who wish to remain independent for as long as possible, without relying on the help of other to complete everyday tasks, a bedside step stool may be a valuable investment. We reviewed a range of products from simple plastic stools to variations that include built-in handrails, so you can find one that will improve your quality of life by making it safer and less stressful to age in place. This is one of the best bedside step stools on the market and it comes with a handrail to help pull yourself up when you need to. This is an excellent footstool ideal for aiding seniors in getting in and out of bed, cars, bathtubs, and other places that might require a high step. The rubber pad on the footstool prevents slipping, and the handrail is durable and does not feel flimsy when you put your weight on it. All of the components of this stool have welds, so you do not have to do any assembly or worry about bolts coming loose without your knowledge. The stool is also 13 pounds, which makes it easy to move when you need it. The primary issue with this stool is the height of the handrail, which requires you to pull yourself up using only the rail with no weight on the stool. This causes the stool to tip over because you do not weight the stool itself. Not sure if it was meant to be this way or if it’s merely a design flaw. 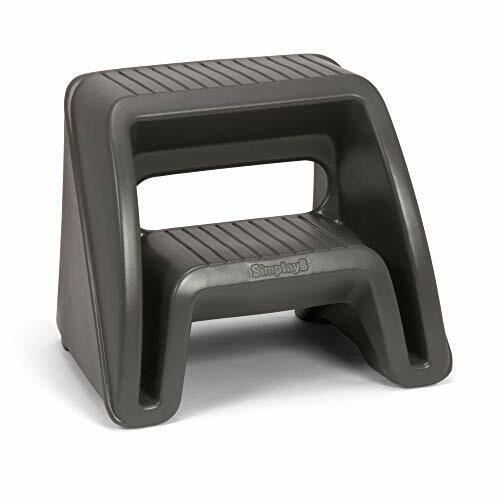 For a plastic step stool this one is incredibly durable and folds up within seconds. For seniors who require a lightweight stool that is easier to transport or move throughout the house, this is an excellent option.. This stool folds up easily to slide underneath the bed or dresser when you are not using it and can be pulled out and set up within seconds. 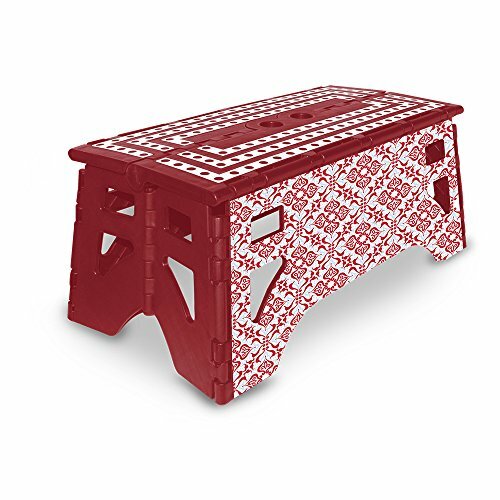 It is a plastic stool, so you are not getting the amount of durability and stability you get from a welded steel stool, but this one is surprisingly sturdy and has a weight capacity of 350 pounds. This step stool is a great option for people who are more mobile and can climb up the two steps. It’s great for use in bathtubs where it will get wet. 8 inch and 16 inch high sturdy steps with extra wide grooves for safety, stability and traction. Step stool is designed for those just out of reach places in kitchens, bathrooms, bedrooms, offices, gardens, and garages. Molded-in notch handle is underneath top step for quick, easy grip carry. Convenient size that's easy to clean and small enough to store almost anywhere. This is a simple plastic stool that has a wide range of applications to make life for seniors aging in place more convenient and stress free. It gets made with a double walled plastic, so it is highly durable and lightweight. It’s great for use in areas where it may get wet because of its design. This would be a great stool for getting in and out of bathtubs. The primary issue we see with this one is that the steps themselves are high and require you to take quite a high step. They are also narrow so putting both feet on them is not exactly logical. Based on the design of this step stool we would recommend this to seniors with good balance and better mobility who need to access something that is out of reach. This step stool comes with a padded handle to help pull yourself up but assembly is quite difficult. 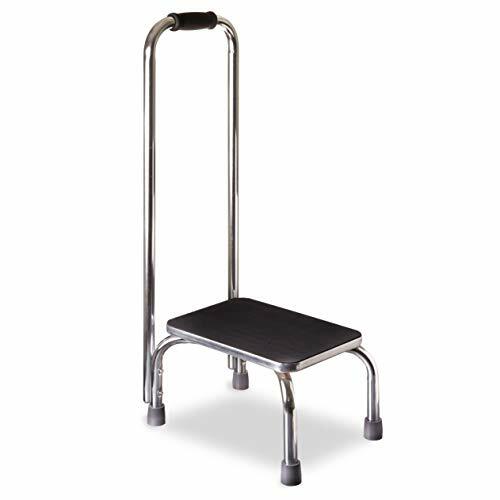 This is a standard steel step stool with a handle and rubber grips, making it a safe and sturdy choice for seniors. The handle itself has a rubber grip on it to prevent slipping, which is necessary since it does require you to pull yourself up using only the handrail. We feel that the design could be improved upon if it included a platform at the base to steady the stool while you stepped up. One of the primary issues we noticed with this stool is the instructions and assembly. The assembly process is difficult due to inappropriate hardware. If you purchase this, be prepared to supply your hardware and call on someone if assistance is required. This simple rubber step stool gives you everything you need without all the fancy bells and whistles. This stool has a simple, no-slip rubber platform that makes a variety of tasks safe and attainable for seniors who live independently. The non-skid rubber is ribbed, providing stability if you have to reach for something high up. The rubber feet are great on surfaces like tile where slipping is common and the stool comes fully assembled and ready to use. 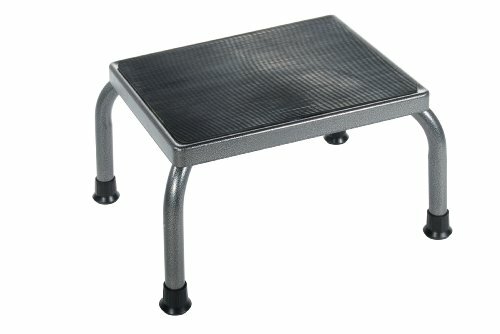 The key benefits of this stool include its overall feeling of durability and broad surface, which accommodates both feet creating a safer, more stable experience..This is perfect for people with limited mobility to step onto because of the moderate height, which is something we find highly important in a step stool that is appropriate for seniors. The budget bed step stool for adults is low to the ground so it’s perfect for people with limited mobility and it folds up easily to hide when you do not need it. 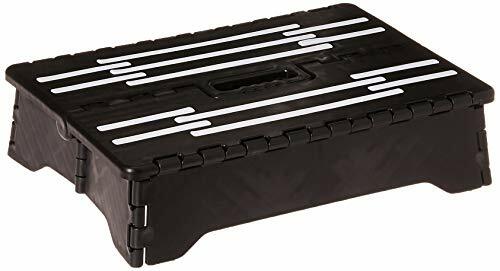 This plastic step stool is a great option if you are looking for something small and easy to transport. 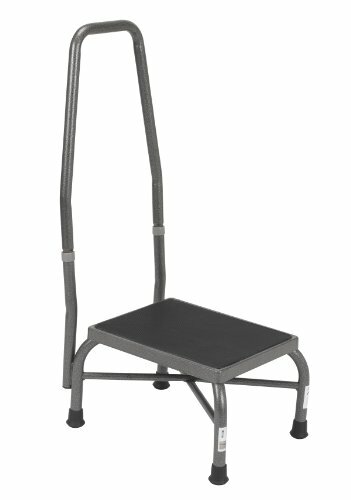 It is ideal for a caregiver who needs a bedside step stool to help the senior in their care get in and out of bed. This step stool is quite a bit lower than a lot of the other ones at well being only four inches high, but this can be a major benefit for seniors who require moderate lift.. For people with limited mobility, it can mean that you get up to the step much easier, but it also means that you have further to go from the step once you are there. The stool has a 300-pound weight capacity, but we only recommend using this stool on carpeted surfaces like a bedroom. The stool has no grip so it will slide easily on tile and even concrete. This great looking stool works best with seniors who still have good mobility. Dimensions: 13"W x 13"D x 13"H.
This dark cherry bedroom stool delivers on style and functionality. . It is perfect for seniors who need extra height to get in and out of bed and includes a bit of storage as well. This stool may not prove safe for seniors who have more limited mobility or who experience dizziness as the surface is slippery and offers no gripping at all. Because it is heavy, especially when used as additional storage area, it becomes a piece of furniture instead of something you transport around as you need it. There are many different options covered above, and even more beyond these, so it’s important to find the right choice for your unique needs. Many variables go into deciding on a bed step stool for adults, and we want to help you make the best purchase. Here are some important factors to consider before purchasing. We noticed this to be an issue with a lot of the step stools we tested. Many of them are too small for someone with limited mobility to stand on with both feet at one time, and to us, that is a deal breaker. The obvious hazard that a stool presents for seniors is falling, so it is incredibly important to consider the height and surface area of the stool in relation to what you need it for most. If you just need it to get in and out of bed, then find a stool that is just high enough off the ground to give you the lift you need. It is essential that seniors avoid heights that exceed their needs as it presents a serious risk should they fall or lose balance. It is also recommended that you find a product that can comfortably hold your weight while accommodating two feet to ensure stability. If both feet cannot be firmly planted without feeling wobbly and unstable, you may want to move on to your next option. A handrail is a great thing to have if it functions properly. We noticed in a lot of the stools we tested that the rail becomes a hazard if you rely on it too much. Using the handrail as the primary source of stability to pull yourself up from the floor can result in the stool tipping over and ultimately you falling. A lot of these handrail stools can be improved upon if they added a platform at the base for you to put your one foot on while you pull yourself up to the step. But even in the absence of that, a handrail may be a very important feature for people who experience dizziness or have trouble balancing, so look for products that are welded together for added security and have a handrail height that is appropriate for your stature. The handrail somewhat lowers the ability to transport the stool from place to place, but if that is not a concern for you, then this type of stool is a great option. Many of the bedside step stools you find on the market are collapsible, plastic ones, so you want to be careful when choosing a portable stool. Some of them lack quality and barely hold 200 pounds (even though they claim to hold 350), so you need to spend some time vetting this category. Several of our recommendations are durable enough to hold your weight, yet portable enough to fold up and slide underneath a dresser. Pay close attention to the size of the stool when folded because some are much more compact than others. This feature is a must when choosing a step stool. You want to make sure you choose one that has plenty of rubber on the stand as well as on the feet. This prevents it from slipping around, but it also keeps you from slipping while you are standing on the stool. 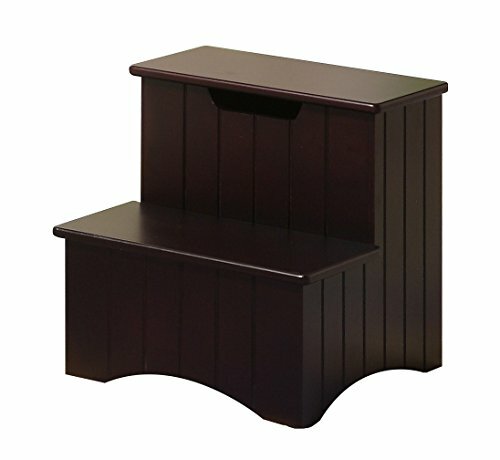 The best bedside step stools have rubber on the platform so you can grip it while you are moving from the stool to your bed. While step stools do carry an inherent risk of falling, they serve a vital purpose in the daily lives of seniors aging in place. Once you find the one that best suits your needs, it can enhance your independence by giving you the ability to do a host of daily tasks that you would otherwise look to help for. Safety of the primary concern when purchasing, so try not to let budget drive your decision, but instead prioritize safety features, materials, and range of uses.